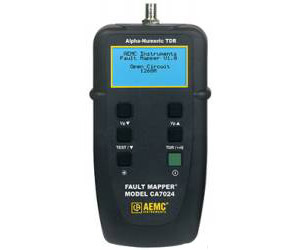 The Fault Mapper® Model CA7024 is a hand-held, alphanumeric, TDR (Time Domain Reflectometer) Cable Length Meter and Fault Locator, designed to measure the length of electrical and communication cables. It can also indicate the distance to a fault in the cable (open or short), given access to only one end of a two or more conductor cable. By incorporating fast-edge step TDR technology, the Model CA7024 measures cable length and indicates the distance to open or short circuit faults. to a range of 6000 ft (2000m), on virtually any type of cable. The Model CA7024 indicates the cable length or fault distance and description, alphanumerically on a 128 x 64 graphical LCD.